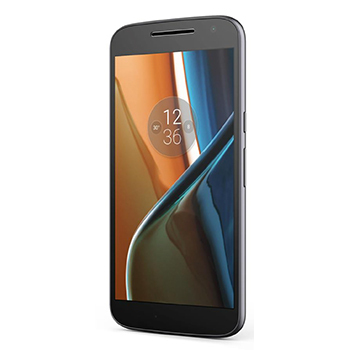 The Moto G4 features a 5.5 inch Full HD 1080p display, protected by Gorilla Glass 3. The solid looking display has great viewing angles and colours are bright, sharp and realistic, perfect for gaming or watching videos. The Moto G4 comes with a 13 megapixel main camera which produces professional looking shots every time. The device features LED flash and a large f/2.0 aperture, perfect for capturing images on a dull day. Quick Capture allows the camera to be launched with a simple twist of the wrist, whilst Best Shot takes multiple images before and after the screen has been touched. It will then recommend the best image to keep. At the front is the 5 megapixel selfie camera with a wide angle lens to get everyone in the shot. With a 3000mAh battery on board there is power for at least a full day. The device features an octa-core Qualcomm Snapdragon 617 processor for running multiple apps at the same time. There is 2GB RAM and expandable internal memory up to 128GB with optional microSD support, together with inbuilt Android 6.0 Marshmallow OS. 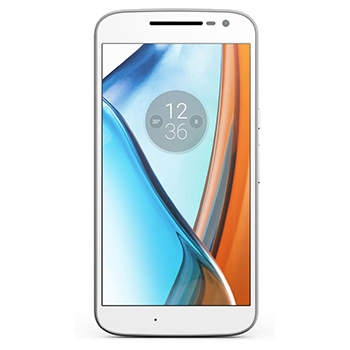 The streamlined Moto G4, the thinnest Moto G to date, comes with a rounded back and a micro-texture on the rear producing a good grip. The device fits perfectly into the pocket and is easy to use one-handed.